"Firing squad" and "shot at dawn" redirect here. For the UK memorial, see Shot at Dawn Memorial. For other uses, see Firing squad (disambiguation). Execution by firing squad, in the past sometimes called fusillading (from the French fusil, rifle), is a method of capital punishment, particularly common in the military and in times of war. Execution by shooting is a fairly old practice. Some reasons for its use are that firearms are usually readily available and a gunshot to a vital organ, such as brain or heart, usually kills relatively quickly. A firing squad is normally composed of several military personnel. Usually, all members of the group are instructed to fire simultaneously, thus preventing both disruption of the process by a single member and identification of the member who fired the lethal shot. To avoid the disfigurement of multiple shots to the head, the shooters are typically instructed to aim at the heart, sometimes aided by a paper target. The prisoner is typically blindfolded or hooded, as well as restrained, although in some cases prisoners have asked to be allowed to face the firing squad without their eyes covered. Executions can be carried out with the condemned either standing or sitting. There is a tradition in some jurisdictions that such executions are carried out at first light or at sunrise. This gave rise to the phrase "shot at dawn". Execution by firing squad is distinct from other forms of execution by firearms, such as an execution by shooting to the back of the head or neck. However, the single shot by the squad's officer with a pistol (coup de grâce) is sometimes incorporated in a firing squad execution, particularly if the initial volley turns out not to be immediately fatal. Before the introduction of firearms, bows or crossbows were often used—Saint Sebastian is usually depicted as executed by a squad of Roman auxiliary archers in around 288 AD; King Edmund the Martyr of East Anglia, by some accounts, was tied to a tree and executed by Viking archers on 20 November 869 or 870 AD. The method is often the supreme punishment or disciplinary means employed by military courts for crimes such as cowardice, desertion, espionage, murder, mutiny, or treason. If the condemned prisoner is an ex-officer who is acknowledged to have shown bravery in their past career, they may be accorded the privilege of giving the order to fire. An example of this is Marshal of France Michel Ney. In some cases, one or more members of the firing squad may be issued a weapon containing a blank cartridge. No member of the firing squad is told beforehand if he is using live ammunition. This is believed to reinforce the sense of diffusion of responsibility among the firing squad members. This diffusion of responsibility makes the execution process more reliable because the members are more likely to aim to kill if they are not entirely blamed for it, or if there is a chance they did not fire the lethal shot. It also allows each member of the firing squad to believe afterwards that he did not personally fire a fatal shot—for this reason, it is sometimes referred to as the "conscience round". According to Pte. W. A. Quinton, who served in the British Army during the First World War and had the experience of serving with a firing squad in October 1915, he and 11 colleagues were relieved of any live ammunition and their own rifles before being issued replacement weapons. The firing squad was then given a short speech by an officer before they fired a volley at the condemned man. He said about the episode, "I had the satisfaction of knowing that as soon as I fired, the absence of any recoil, [indicated] that I had merely fired a blank cartridge". In more recent times, such as in the execution of Ronnie Lee Gardner in the American state of Utah in 2010, one rifleman may be given a "dummy" cartridge containing a wax bullet instead of a lead bullet, which provides a more realistic recoil. On 1 April 1916 a Belgian woman, Gabrielle Petit, was executed by a German firing squad at Schaerbeek after being convicted of spying for the British Secret Service during World War I. During the Battle of the Bulge in World War II, three captured German spies were tried and executed by a U.S. firing squad at Henri-Chapelle on 23 December 1944. Thirteen other Germans were also tried and shot at either Henri-Chapelle or Huy. These executed spies took part in Waffen-SS commando Otto Skorzeny's Operation Greif, in which English-speaking German commandos operated behind U.S. lines, masquerading in U.S. uniforms and equipment. The Brazilian Constitution of 1988 expressly prohibits the usage of capital punishment in peacetime, but authorizes the use of the death penalty for military crimes committed during wartime. War needs to be declared formally, in accordance with international law and article 84, item 19 of the Federal Constitution, with due authorization from the Brazilian Congress. The Brazilian Code of Military Penal Law, in its chapter dealing with wartime offences, specifies the crimes that are subject to the death penalty. The death penalty is never the only possible sentence for a crime, and the punishment must be imposed by the military courts system. Per the norms of the Brazilian Code of Military Penal Procedure, the death penalty is carried out by firing squad. Although Brazil still permits the use of capital punishment during wartime, no convicts were actually executed during Brazil's last military conflict, the Second World War. The military personnel sentenced to death during World War II had their sentences reduced by the President of the Republic. Following the military overthrow of the democratically elected government of Salvador Allende in 1973, Chilean dictator Augusto Pinochet initiated a series of mock war tribunal trials against communists around the country. During the first months of the coup, hundreds of Chileans were killed by firing squads and summary executions. Under mandates from Pinochet, Gen. Sergio Arellano Stark led an army unit that traversed Chile by helicopter in the weeks after the overthrow of Allende, killing his supporters or anyone seen as hostile to the new government. The Pinochet regime, which reigned from 1973–90, was one of Chile's most violent. According to official data, more than 3000 people were reported as executed and disappeared, more than 40,000 suffered from human rights abuses and almost a million exiled during his 17-year rule, which took place after the coup and the death of Allende. Cuba, as part of its penal system, still utilizes death by firing squad, although the last recorded execution was in 2003. In January 1992 a Cuban exile convicted of "terrorism, sabotage and enemy propaganda" was executed by firing squad. The Council of the State noted that the punishment served as a deterrent and stated that the death penalty "fulfills a goal of overall prevention, especially when the idea is to stop such loathsome actions from being repeated, to deter others and so to prevent innocent human lives from being endangered in the future". During the months following the triumph of the Cuban Revolution in 1959, soldiers of the Batista government were executed by firing squad. The death penalty was widely used during and after the Finnish Civil War (January–May 1918); some 9,700 Finns and an unknown number of Russian volunteers on the Red side were executed during the war or in its aftermath. Most executions were carried out by firing squads after the sentences were given by illegal or semi-legal courts martial. Only some 250 persons were sentenced to death in courts acting on legal authority. During World War II some 500 persons were executed, half of them condemned spies. The usual causes for death penalty for Finnish citizens were treason and high treason (and to a lesser extent cowardice and disobedience, applicable for military personnel). Almost all cases of capital punishment were tried by court-martial. Usually the executions were carried out by the regimental military police platoon, or in the case of spies by the local military police. One Finn, Toivo Koljonen, was executed for a civilian crime (six murders). Most executions occurred in 1941 and during the Soviet Summer Offensive in 1944. The last death sentences were given in 1945 for murder, but later commuted to life imprisonment. The death penalty was abolished by Finnish law in 1949 for crimes committed during peacetime, and in 1972 for all crimes. Finland is party to the Optional protocol of the International Covenant on Civil and Political Rights, forbidding the use of the death penalty in all circumstances. 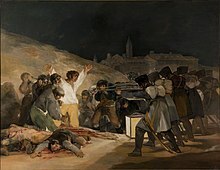 Execution of the Madrid rebels by a French firing squad on the Third of May 1808, as painted by Francisco Goya. Execution at Verdun at the time of the French Army Mutinies of 1917. Pte. Thomas Highgate was the first British soldier to be convicted of desertion and executed by firing squad in September 1914 at Tournan-en-Brie during World War I. In October 1916 Pte. Harry Farr was shot for cowardice at Carnoy, which was later suspected to be acoustic shock. Highgate and Farr, along with 304 other British and Imperial troops who were executed for similar offenses, were listed at the Shot at Dawn Memorial which was erected to honor them. On 15 October 1917 Dutch exotic dancer Mata Hari was executed by a French firing squad at Château de Vincennes castle in the town of Vincennes after being convicted of spying for Germany during World War I. During World War II, on 24 September 1944, Josef Wende and Stephan Kortas, two Poles drafted into the German army, crossed the Moselle Rivers behind U.S. lines in civilian clothes, posing as Polish slave laborers, to observe Allied strength and were to rejoin their own army on the same day. However, they were discovered by the Americans and arrested. On 18 October 1944 they were found guilty of espionage by a U.S. military commission and sentenced to death. On 11 November 1944 they were shot in the garden of a farmhouse at Toul. The footage of Wende's execution as well as Kortas's is shown in these links. On 15 October 1945 Pierre Laval, the puppet leader of Nazi-occupied Vichy France, was executed by firing squad at Fresnes Prison in Paris for treason. Execution by firing squad is the capital punishment method used in Indonesia. The following persons were executed (reported by BBC World Service) by firing squad on 29 April 2015 following convictions for drug offences: two Australians, Myuran Sukumaran and Andrew Chan, the Ghanaian Martin Anderson, the Indonesian Zainal Abidin bin Mgs Mahmud Badarudin, three Nigerians: Raheem Agbaje Salami, Sylvester Obiekwe Nwolise and Okwudili Oyatanze, as well as Brazilian Rodrigo Gularte. In 2006 Fabianus Tibo, Dominggus da Silva and Marinus Riwu were executed. Nigerian drug smugglers Samuel Iwachekwu Okoye and Hansen Anthoni Nwaolisa were executed in June 2008 in Nusakambangan Island. Five months later three men convicted for the 2002 Bali bombing—Amrozi, Imam Samudra and Ali Ghufron—were executed on the same spot in Nusakambangan. In January 2013 56-year-old British woman Lindsay Sandiford was sentenced to execution by firing squad for importing a large amount of cocaine; she lost her appeal against her sentence in April 2013. While on 18 January 2015, under the new leadership of Joko Widodo, six people who were convicted of producing and smuggling drugs into Indonesia who had been sentenced to death were executed at Nusa Kambangan Penitentiary shortly after midnight. Following the 1916 Easter Rising in Ireland, 15 of the 16 leaders who were executed were shot by British military authorities under martial law. The executions have often been cited as a reason for how the Rising managed to galvanise public support in Ireland after the failed rebellion. Italy had used the firing squad as its only form of death penalty, both for civilians and military, since the unification of the country in 1861. The death penalty was abolished completely by both Italian Houses of Parliament in 1889 but revived under the Italian dictatorship of Benito Mussolini in 1926. Mussolini was himself shot in the last days of World War Two. On 1 December 1945 Anton Dostler, the first German general to be tried for war crimes, was executed by a U.S. firing squad in Aversa after being found guilty by a U.S. military tribunal of ordering the killing of 15 U.S. prisoners of war in Italy during World War II. The last execution took place on 4 March 1947, as Francesco La Barbera, Giovanni Puleo and Giovanni D'Ignoti, sentenced to death on multiple accounts of robbery and murder, faced the firing squad at the range of Basse di Stura, near Turin. Soon after the Constitution of the newly proclaimed Republic prohibited the death penalty except for some crimes, like high treason, during wartime; no one was sentenced to death after 1947. In 2007 the Constitution was amended to ban the death penalty altogether. Firing squads were used during the French and British occupation of Malta. Ringleaders of rebellions were often shot dead by firing squad during the French period, with perhaps the most notable examples being Dun Mikiel Xerri and other patriots in 1799. The British also used the practice briefly, and for the last time in 1813, when two men were shot separately outside the courthouse after being convicted of failing to report their infection of plague to the authorities. Execution of Emperor Maximilian of Mexico, by Édouard Manet, 1868. During the Mexican Independence War, several Independentist generals (such as Miguel Hidalgo and José María Morelos) were executed by Spanish firing squads. Also, Emperor Maximilian I of Mexico and several of his generals were executed in the Cerro de las Campanas after the Juaristas took control of Mexico in 1867. Manet immortalized the execution in a now-famous painting, The Execution of Emperor Maximilian; he painted at least three versions. Firing-squad execution was the most common way to carry out a death sentence in Mexico, especially during the Mexican Revolution and the Cristero War. An example of that is in the attempted execution of Wenseslao Moguel, who survived being shot ten times—once at point-blank range—because he fought under Pancho Villa. After these events, the death sentence was reduced to some events in Article 22 of the Mexican Constitution; however, in 1917 capital punishment was abolished completely. 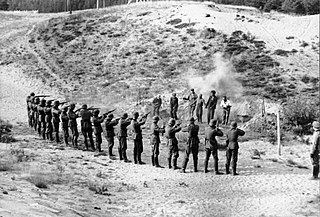 During the Nazi occupation in World War II some 3,000 persons were executed by German firing squads. The victims were sometimes sentenced by a military court; in other cases they were hostages or arbitrary people passing by who were executed publicly to intimidate the population and as reprisals against the resistance movements. After the attack on high-ranking German officer Hanns Albin Rauter, about 300 people were executed publicly as reprisal. Rauter himself was executed near Scheveningen on 12 January 1949, following his conviction for war crimes. Anton Mussert, a Dutch Nazi leader, was sentenced to death by firing squad and executed in the dunes near The Hague on 7 May 1946. While under Allied guard in Amsterdam, and five days after the capitulation of Nazi Germany, two German Navy deserters were shot by a firing squad composed of other German prisoners kept in the Canadian-run prisoner-of-war camp. The men were lined up against the wall of an air raid shelter near an abandoned Ford Motor Company assembly plant in the presence of Canadian military. Nigeria executed criminals who committed armed robberies—such as Ishola Oyenusi, Lawrence Anini and Monday Osunbor—as well as military officers convicted of plotting coups against the government, such as Buka Suka Dimka and Maj. Gideon Orkar, by firing squad. It is still being used to this day. Vidkun Quisling, the leader of the collaborationist Nasjonal Samling Party and of Norway during the German occupation in World War II, was sentenced to death for treason and was executed by firing squad on 24 October 1945 at the Akershus Fortress. Jose Rizal was executed by firing squad on the morning of 30 December 1896, in what is now Rizal Park, where his remains have since been placed. During the Marcos administration, drug trafficking was punishable by firing-squad execution, as was done to Lim Seng. Execution by firing squad was later replaced by the electric chair, then lethal injection. On 24 June 2006 President Gloria Macapagal-Arroyo abolished capital punishment by Republic Act 9346. Existing death row inmates, who numbered in the thousands, were eventually given life sentences or reclusion perpetua instead. Mass execution of 56 Polish citizens in Bochnia, near Kraków, following the Nazi invasion of Poland, December 18, 1939. Nicolae Ceaușescu was executed by firing squad alongside his wife while singing the Communist Internationale following a show trial, bringing an end to the Romanian Revolution, on Christmas Day, 1989. In Tsarist Russia firing squads were, undoubtedly, used in the army, for executions during combat on the orders of military tribunals. In the Soviet Union, from the very earliest days, the bullet to the back of the head, in front of a ready-dug burial trench was by far the most common practice. It became especially widely used during the Great Purge. Executions in Saudi Arabia are usually carried out by beheading; however, at times other methods have been used. Al-Beshi, a Saudi executioner, has said that he has conducted some executions by shooting. Misha'el bint Fahd bin Mohammed al Saud, a Saudi princess, was also executed in the same way. Australian soldiers Harry "Breaker" Morant and Peter Handcock were executed by a British firing squad in the South African Republic on 27 February 1902 for war crimes during the Second Boer War; questions have since been raised[by whom?] in Australia as to whether they received a fair trial. In the United Arab Emirates, firing squad is the preferred method of execution. Execution by firing squad in the United Kingdom was limited to times of war, armed insurrection and in the military, although it is now outlawed in all circumstances, along with all other forms of capital punishment. The Tower of London was used during both World Wars for executions. During World War I, 11 captured German spies were shot between 1914-1916, nine on the Tower's rifle range and two in the Tower Ditch. All of these spies were buried in East London Cemetery, in Plaistow, London. On 15 August 1941, German Cpl. Josef Jakobs was shot for espionage during World War II, the last person to be executed at the Tower. The U.S. Army took over Shepton Mallet prison in Somerset in 1942, renaming it Disciplinary Training Center No.1 and housing troops convicted of offences across Europe. There were eighteen executions at the prison, two of them by firing squad for murder: Pvt. Alexander Miranda on 30 May 1944 and Pvt. Benjamin Pygate on 28 November 1944. Locals complained about the noise, as the executions took place in the prison yard at 1:00am. Since the 1960s, there has been some controversy concerning the 346 British and Imperial troops—including 25 Canadians, 22 Irish and five New Zealanders—shot for desertion, murder, cowardice and other offences during World War I, some of whom are now thought to have been suffering from combat stress reaction or post-traumatic stress disorder ("shell-shock", as it was then known). This led to organisations such as the Shot at Dawn Campaign being set up in later years to try to uncover just why these soldiers were executed. The Shot at Dawn Memorial was erected at Staffordshire to honour these soldiers. In the American Civil War, 433 of the 573 men executed (186 of the 267 executed by the Union Army and 247 of the 306 executed by the Confederate Army) were shot by a firing squad. During World War II, Army Pvt. Edward "Eddie" Slovik was the first soldier executed by firing squad for desertion since the American Civil War. In 1913, Andriza Mircovich became the first and only inmate in Nevada to be executed by shooting. After the warden of Nevada State Prison could not find five men to form a firing squad, a shooting machine was built to carry out Mircovich's execution. John W. Deering allowed an electrocardiogram recording of the effect of gunshot wounds on his heart during his 1938 execution by firing squad, and afterwards his body was donated to the University of Utah School of Medicine, at his request. Utah's 1960 execution of James W. Rodgers became the last execution by firing squad in the United States for nearly two decades. Since 1960 there have been three executions by firing squad, all in Utah: Gary Gilmore was executed in 1977, while John Albert Taylor chose a firing squad for his 1996 execution, in the words of The New York Times, "to make a statement that Utah was sanctioning murder". However, a 2010 article for the British newspaper The Times quotes Taylor justifying his choice because he did not want to "flop around like a dying fish" during a lethal injection. Ronnie Lee Gardner was executed by firing squad in 2010, having said he preferred this method of execution because of his "Mormon heritage". Gardner also felt that lawmakers were trying to eliminate the firing squad, in opposition to popular opinion in Utah, because of concern over the state's image in the 2002 Winter Olympics. Execution by firing squad was banned in Utah in 2004, but as the ban was not retroactive; three inmates on Utah's death row have the firing squad set as their method of execution. Idaho banned execution by firing squad in 2009, temporarily leaving Oklahoma as the only state in the union utilizing this method of execution (and only as a secondary method). Reluctance by drug companies to see their drugs used to kill people has led to a shortage of the commonly used lethal injection drugs. In March 2015, Utah enacted legislation allowing for execution by firing squad if the drugs they use are unavailable. Several other states are also exploring a return to the firing squad. Justice Sonia Sotomayor argued in Arthur v. Dunn: "In addition to being near instant, death by shooting may also be comparatively painless ... And historically, the firing squad has yielded significantly fewer botched executions." ^ Huie, William Bradford (1954). The Execution of Private Slovik. Duell, Sloan & Pearce. p. 208. ISBN 978-1594160035. ^ "Crime Library: Firing Squad". Crime Museum. 2016-05-25. Retrieved 2016-05-30. ^ "Procedure for Military Executions" (PDF). Department of the Army. December 1947. Retrieved 2017-01-23. ^ Carver, Field Marshal Lord Michael (1999-11-12). Britain's Army in the Twentieth Century. ISBN 978-0330372008. Gas operated actions such as recoil depend on a high pressure state that only exists when the gas is trapped between the breech and the moving projectile. As there is no bullet in the blank, the recoil is greatly reduced. ^ Westcott, Kathryn (June 18, 2010). "How and why Gardner was shot". BBC News. ^ "HD Stock Video Footage - Military police execute German spies in Belgium". Criticalpast.com. Retrieved 23 November 2017. ^ "Brazilian Laws - the Federal Constitution - Individual and collective rights and duties". V-brazil.com. Retrieved 23 November 2017. ^ "Chile dictatorship victim toll bumped to 40,018 | CBC News". CBC. Retrieved 2018-05-15. ^ a b "Cuban Firing Squad Executes Exile". The New York Times. 21 January 1992. Silvia Pedraza, Political Disaffection in Cuba's Revolution and Exodus (Cambridge University Press, 2007), p. 62. Samuel Farber, The Origins of the Cuban Revolution Reconsidered (University of North Carolina Press: 2006), p. 96. ^ "FINLEX ® - Valtiosopimukset viitetietokanta: 7/1976". Finlex.fi. Retrieved 23 November 2017. ^ a b The Shot at Dawn Campaign The New Zealand government pardoned its troops in 2000; the British government in 1998 expressed sympathy for the executed and in 2006 the Secretary of State for Defence announced a full pardon for all 306 executed soldiers from the First World War. ^ "Mata Hari is executed - Oct 15, 1917 - HISTORY.com". History.com. Retrieved 23 November 2017. ^ David Kahn (June 2000). Hitler's Spies: German Military Intelligence In World War II. Da Capo Press; 1 edition. p. 363. ISBN 0-3068-0949-4. ^ "HD Stock Video Footage - German spy Josef Wende is executed by U.S. Military Police firing squad in Toul, France, during World War II". Criticalpast.com. Retrieved 23 November 2017. ^ "HD Stock Video Footage - German spy Stephan Kortas is executed by Military Policemen and is carried away covered in white sheet in Toul France". Criticalpast.com. Retrieved 23 November 2017. ^ David Kahn (June 2000). Hitler's Spies: German Military Intelligence In World War II. Da Capo Press; 1 edition. p. 504 and 505. ISBN 0-3068-0949-4. ^ "Vichy leader executed for treason - Oct 15, 1945". History.com. Retrieved 23 November 2017. ^ "Pierre Laval : Biography". 3 September 2013. Archived from the original on 3 September 2013. Retrieved 23 November 2017. ^ "Judicial follow up of the assassination attempt of Petit-Clamart". fr.wikipedia.org. Retrieved 10 April 2019. ^ Agus Maryono and Suherdjoko (June 28, 2008). "Nigerian drug smugglers buried a day after execution". The Jakarta Post. ^ "Bali bomb burials stoke tensions". BBC News. November 9, 2008. Retrieved March 27, 2010. ^ 11 Feb 2013 (2013-02-11). "British grandmother Lindsay Sandiford appeals Indonesia death sentence". Telegraph. Retrieved 2013-07-25. ^ Karishma Vaswani (2013-01-22). "BBC News — Bali drugs: Death sentence for Briton Lindsay Sandiford". M.bbc.co.uk. Retrieved 2013-07-25. ^ "'At least a bullet is quick': British grandmother on death row in Indonesia for smuggling drugs prefers firing squad". NY Daily News. Retrieved 2013-07-25. ^ AFP (2015-01-18). "Fury as Indonesia executes foreigners by firing squad". Daily Mail. Retrieved 2015-01-18. ^ English, R. Irish Freedom, (London, 2006), p. 264-276. ^ "BBC - History - Historic Figures: Benito Mussolini (1883-1945)". Bbc.co.uk. Retrieved 23 November 2017. ^ a b Attard, Edward (2002). Il-Piena Kapitali f'Malta u Pajjiżi Oħra (in Maltese). San Gwann, Malta: BDL Publishing. pp. 161–172. ISBN 978-99909-72-12-2. OCLC 254597108. Archived from the original on 2017-08-19. ^ "Dutch Nazi Executed," Amarillo Globe, May 7, 1946, p.1. ^ Chris Madsen (August 2006). "Victims of Circumstance" (PDF). Canadian Military History. Scholars.wlu.ca (CanadianMilitaryHistory.ca reprint). 2: Iss. 1, Article 8. Archived from the original (PDF) on 2012-02-04 – via Internet Archive. 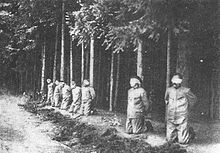 See: 13 May 1945 German deserter execution in Wikipedia. ^ "Philippines 'restores' death penalty". BBC News. December 21, 2003. Retrieved May 2, 2010. ^ Emma Graham-Harrison. "'I'm still nervous,' says soldier who shot Nicolae Ceausescu | World news". The Guardian. Retrieved 2016-05-30. ^ Chapter 2, "Niyazov", in Lev Razgon, True Stories: Memoirs of a Survivor, Souvenir Press: London, 1999, pp. 21-34. ^ Ahmed, Mahmoud (6 June 2003). "The work of God". The Guardian. ^ Hubbard, Ben (18 October 2016). "Saudi Arabia Executes a Prince Convicted in a Fatal Shooting". Nytimes.com. ^ Laube, Lydia (1 January 1991). "Behind the Veil: An Australian Nurse in Saudi Arabia". Wakefield Press – via Google Books. ^ Weston, Mark (28 July 2008). "Prophets and Princes: Saudi Arabia from Muhammad to the Present". John Wiley & Sons – via Google Books. ^ "Saudi Arabia Carries Out Largest Mass Execution Since 1980". Eurasiareview.com. 4 January 2016. Retrieved 23 November 2017. ^ United Arab Emirates (UAE): Death penalty, Archived October 14, 2007, at the Wayback Machine Amnesty International (Urgent Action), April 3, 2002. ^ "Nevada State Prison Inmate Case Files: Andriza Mircovich". Nevada State Library and Archives. Archived from the original on April 6, 2010. Retrieved November 8, 2010. ^ "No One To Shoot Murderer" (PDF). The New York Times. August 12, 1912. Retrieved November 9, 2010. ^ Cafferata, Patty (June 2010). "Capital Punishment Nevada Style". Nevada Lawyer. State Bar of Nevada. Archived from the original on July 18, 2010. Retrieved November 8, 2010. ^ Boese, Alex (2007). "Heartbeat at Death". Elephants on Acid: And Other Bizarre Experiments. Houghton Mifflin Harcourt. pp. 246–249. ISBN 9780156031356. Retrieved December 20, 2010. ^ "Firing Squad Executes Killer". The New York Times. 1996-01-27. Retrieved 2008-06-16. ^ Giles Whittell (2010-04-24). "Utah death row inmate Ronnie Lee Gardner elects to die by firing squad". The Times. London. ^ Donaldson, Amy (1996-02-09). "Inmate threatens to sue if state won't let him die by firing squad". Deseret News. p. A1. Retrieved 2010-09-25. ^ "Methods of Execution". Death Penalty Information Center. 2010. Retrieved 2010-06-17. ^ Dobner, Jennifer (January 22, 2004). "Plan to abolish firing squad advances". Deseret News. pp. 1–2. Retrieved 2010-10-03. ^ "Recent Legislative Activity". Death Penalty Information Center. 2009. Retrieved 2009-10-30. ^ Horne, Jennifer (2017). "Lethal Injection Drug Shortage". Council of State Governments. Retrieved 2017-04-07. ^ "Why the execution drug shortage won't go away". Los Angeles Times. 2015-04-13. ISSN 0458-3035. Retrieved 2017-04-07. ^ Associated Press. "Firing squad gets final OK. So how does it work?" Salt Lake City Tribune (March 24, 2015). ^ "The Firing Squad Is Making a Comeback in Death Penalty Cases". US News. 2017-03-03. Archived from the original on 2017-03-03. Retrieved 2017-04-07. Wikimedia Commons has media related to Firing squad.